More than 5 Railway Ministers and a few Governments have come and gone but the dream of a Mangalorean to travel to Bangalore by train has never been realised. The irony here is that the infrastructure is ready, However there is a lack of political will required to fuel the initiation of the train Service. 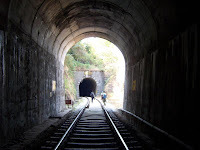 The Managlore to Bangalore route is one of the beautiful train routes that I have travelled on. The last time i did it was almost 13 years ago..Since then I have just been waiting and waiting always. Our Leaders in mangalore and Karnataka overall have just used this issue for public sympathy and now for public rage which has taken us nowhere for the last 11 years now. Interestingly, Keralites and their Leaders have begun showing interest in this route and Kerala Congress Gen. Secretary K Sudhakaran met prime minister Dr Manmohan Singh through union minister Vayalar Ravi on November 1 while the PM was on his visit to Kerala. He also submitted a memorandum that had the following details. 2. 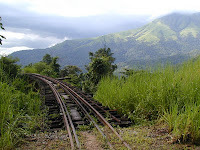 The rail-laying work was completed six months ago. But only goods trains are being run on the track. 3. Paradoxically, while a 3-engine, 40-bogied, 5000-tonne goods train can run safely at a time, a 800-tonne passenger train is not allowed to run. It definitely looks like our Keralite brothers are more keen on getting this project to work than our local leaders. DV Sadananda Gowda has been a man of Words and nothing else. Its high time that people realise that “leaders” like Dhananjay Kumar, Sadanand Gowda are INCOMPETANT to handle our City. We should find new and Better Leaders to Take our cause. In the Meantime however, We should Intensify our battle in getting the Trains Started. Can we begin This…and if we Can… How do we? Yes indeed. There has been no will to get it running; either from the public or the political leaders. Ofcourse, let it actually get to run. We have seen enough of such promises. Yeo… The train is no more a vanishing reality…Its A Running Reality….Am so glad we have the Train. now, step 2 is being delayed by the bus lobby. the best thing to do is put up with the delay and travel in train. as much as possible, somehow people should avoid the bus, r start putting pressure on bus lobbies for bad behavior, unethical conduct – like seasonal fares being jacked up at the last minute etc. they have only one advantage with bus service reaching the interiors of the city instead of one spot like ksrtc or railways do. but ksrtc and railways are always ontime – most of the time ( i never thought there would be a day when i’d praise the government service!) , but these blundering idiots of private buses are most often late – they reach well beyond 10 am , and sometimes have reached in the afternoon or evening – making that a whole day of travel! the government buses have backup in the event of a failure. the private buses sometimes switch of f the a/c in the ruse of the machinery getting spoilt. the buses sometimes dont reach the destination they promise – like say indiranagar (which they would have promised) or koramangala, and abruptly stop at some random depot of theirs – the result is that the passenger has to pay in access of Rs100-200 sometimes!!!! heck the worst thing is that laloo openly admitted that bus and lorry lobbies had stopped this lucrative route from coming up in the first place! 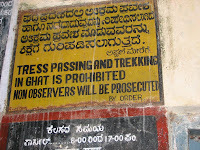 when they finally did start it – they forced it through mysore instead of a shorter route! we can easily have a shorter route to bangalore and have 2 trains a day – one during the day – and one during the night starting from both destination.